Every now, and again a game comes along with the idea of simplifying things. Many look to the Super Smash Bros. games, Nidhogg, and even Divekick as primary examples. All of which take different approaches to doing so. Smash simplifies inputs, and goes for ring outs. Nidhogg goes for a fencing theme, while Divekick reduces everything down to one button. One Strike doesn’t quite go that far, but it does try to be interesting in its mission. PROS: An interesting take on simplifying the fighter. CONS: It doesn’t take long to notice a formula. CLASH: Of the art styles. One Strike is a one on one fighter that tries to be different by living up to its namesake. You simply lose a round (or a match!) by suffering one hit. It takes a page from Soul Calibur by making each character a master of a specific weapon. There are sword masters. Dagger masters. Staff masters. They have you covered. And controlling your fighter is pretty straightforward. You can move left or right, block, strike, or dodge. That’s pretty much it. The game has a really nice art style considering that it’s a bite-sized fighter. There are really great painted portraits of each of the fighters. But the characters themselves are done in a sprite art style somewhere between the look of an Atari 800 computer, and an NES. This isn’t bad by any means. There are all kinds of cool, little details in the backgrounds, as well as animations in them you wouldn’t likely see on these retro platforms. The drawback of course is that these art styles clash somewhat. Seeing the 8-bit inspired sprites represented by icons that could have made it into a late 90’s arcade cabinet can be a little bit jarring. Still, while that may be jarring, and the character select screen is a little anemic, One Strike has a really cool look to it. Unfortunately there’s one major thing that kills the whole game that I’ll get to shortly. One Strike gives you an arcade ladder for some single player content. You can choose to play it on a five lives per match setting, or you can play it as a gauntlet match that provides you but one life. And these modes aren’t too bad. They’ll take the average person a fair number of attempts to clear. The concept is simple. Stab the other person once to win the round or match. Kill everybody, and you win the entire tournament. There is also a Team Battle where you can pick three characters, each with one life, and go on either an arcade ladder by yourself, or you can play in a head to head versus battle. One nice feature the game also has is the ability to set up a tournament bracket. It’s something small, but it is nice for any venue looking to have another tournament for, as your brackets are already set up in it. But like all fighting games, the head to head fighting is what keeps you coming back. The challenge of trying to outwit, or outmaneuver them. Or to learn how to properly defend yourself. There are no combos here because it’s a one hit, and you’re dead affair. But you can still overpower your opponent in theory. Unfortunately, there is one tactic that most will discover in a couple of hours, and that is how to utilize hit stun. All fighting games have a tiny window of time when you can make an opponent unable to react. Usually a second or less. In this game you can do this with a successful block. Blocking at just the right time will employ hit stun on your opponent. They’ll have a split second where they can’t block in time or move backward. So if you’re the least bit quick enough you can bait them into swinging, you can get the block, and immediately stab them for the win. And the reverse is true. So matches often boil down to a Swing/Block/Stab/Match Over formula. Which can get really tiresome really quick. Now to alleviate this to some degree, block windows are very small. You can’t sit in a blocking position forever. After a moment your character will go back to their standard animation. Some characters also have the ability to cancel a move by creating stances. For instance, Oni requires you to press attack twice. Pressing it the first time gets you into a combat stance. Pressing it again swings his club. So you can dodge backward after the first button press if you don’t think it’s safe. With advanced strategies like this, the aforementioned formula isn’t always going to be the way a match goes down. Be that as it may, it does happen often enough that many people may grow bored with things quickly. It’s a shame because this hinders strategies. I’m sure someone far better at One Strike may see this, and have a difference of opinion. But as far as my experience has been playing with both people who are adept at competitive games, and others who are not, matches often result in either predictable fast matches, or (once both players have become more adept at blocking) drawn out matches reliant on turtling, or being overly defensive. All in all, One Strike isn’t a terrible game though. It functions very well, it has likable characters, and a really cool concept. But in practice, there isn’t enough here to keep most fighting fans playing it days on end. Nor are there enough characters to draw more average players into playing it for long. You could easily play this over some of the other stuff out there it’s true. But then you could also go back, and play the classics. In spite of its shortcomings I wouldn’t mind seeing a sequel though. There’s a decent foundation here. You’ll likely really enjoy it initially. But after some time with it, that excitement may wane. If it had a couple of other options in the combat to keep things interesting, a few more characters, and internet matches it would be a better game worth checking out. If you don’t mind a fighting game you’ll play for an hour at a party with friends every few months you’ll have some fun with it. But for others, unless you’re really starved for newer fighting game concepts you might just want to go back to something else. Your mileage may vary with this one. Super Smash Bros. is one of Nintendo’s most beloved franchises of all time. It started out humbly enough on the Nintendo 64. Then it became a massive success on the Nintendo Gamecube, being one of the console’s top drivers. Every sequel since, has done gangbusters. Even iterations that weren’t as well liked, have all sold well, and have been enjoyed by the general audience. Super Smash Bros. Ultimate is one of the most hyped upcoming entries yet. So it should be no surprise, that over the years many games large, and small have experimented with Nintendo’s formula. From Cartoon Network Punch Time Explosion XL to PlayStation All Stars Battle Royale, other developers have tried making platformer fighting games. Some of them have been solid. Some have been pretty good. Some have been outright terrible. But Slam Land has to be one of the better takes on the formula I’ve purchased, and played. PROS: Great visuals, audio, and a compelling twist on a proven formula. CONS: No online multiplayer. Small character roster. Why is this? Well, because it has a really simple mechanic that really changes the dynamics of the game. Instead of the game focusing on knocking every player out of the arena, it adds a proverbial basket to each of the game’s arenas. The object is instead, centered around throwing or punching your opponents into the goal like a basketball. But it doesn’t end there. You can stack multiple opponents together for major point bonuses when you dunk them. You can “Steal” the ball so to speak, by knocking an opponent out of the hands of another opponent, and catching them for yourself. This one simple change also keeps people running to the goal. So you don’t find yourself falling off of the stage, at the last second, unable to see yourself in the mayhem. At least not as often as you might have in some of the Super Smash Bros. games. Slam Land also makes a few adjustments to keep things from getting monotonous. Namely by adding a few different modes. There’s a Trash mode, where instead of throwing each other, you, and opponents collect garbage bags to throw into a goal. As is the case with the main mode, you can knock bags away from people or throw them off the stage to buy yourself some time. You can also, again, stack up multiple bags to dunk at the same time for big points. But the more you carry, the slower you move, allowing an enemy to knock you down, and take them away. Another variation is the game of Horse, where you spell the word “Horse” by getting baskets as in the basketball game. However, it does this by dropping Knight pieces with the corresponding letters into the map. And once you get one letter into the basket, you can’t score with the same letter again. So the four of you will be trying to balance getting letters you need, and throwing the ones you don’t need out of the map. This way you can keep opponents from catching up to you. The other mode you can play is Peanut. This mode drops a peanut into the stage. Again, you’ll all want the peanut so you can shoot a basket for points. However, the longer you hold the peanut before dunking it, the more points you will get for doing so. So if you can hold it for several seconds you can be scoring 8 points or 12 points instead of only one. Of course, as in the other modes, enemies can knock you down. Thus claiming the peanut for themselves for a massive point boost. Every one of these variations is a lot of fun because they all feature a great sense of risk versus reward. Do you go for more bags for the big points, or do you just throw one to retain the speed to get away from everyone? Do you hold the peanut or go for a shot before someone can steal it? Do you throw your opponent now or wait until they’re distracted by someone else? All of the modes go for three rounds too. So you might dominate one round, only to find you’ve been triple teamed faster than Braun Strowman in a fatal four-way. Even so, you’ll find all of them quite engaging. You can also play the primary mode with either time or stock rules. These work the way they do in Smash Bros. Where you’re either trying to get the highest score in a duration, or trying to be the last person with any lives left. The difference however is that stock mode in Slam Land, means you’re still going for points by eliminating opponents. Unlike Smash, you can be the last one standing, and still lose. So you can’t expect to turtle your way to victory. There is also a pseudo-campaign mode here, but really it just puts you in five games involving a mix of the pre-existing modes. I recommend playing through it initially because you’ll get acquainted with the modes right away to see which you enjoy the most. After that though, you can really roll with whichever modes you, and your group of friends like most. Rounding that out is a quick mode that just starts up a single game. Audio-visually the game is really quite nice! Everything has a really crisp 2D look that resembles a sticker book. The characters all have a cute look infused with some pulp. It screams early 90’s Nickelodeon cartoons, and even some contemporary Adult Swim cartoons. One of the playable characters reminded me a bit of The Ren & Stimpy Show, while the ominous blue character who shows up in some of the game’s stage backgrounds reminded me a lot of stuff like Superjail. But that isn’t to say any of this stuff feels like a copy of anything. Everything is wholly original, but these are just some of the things I was reminded of by the game’s art style. The bottom line is that it looks great. The light audio soundtrack, and booming announcer voice accent all of it very nicely too. There are a few things that I would have liked the game to have implemented though. While I love the look of the characters I would have liked to have had a bigger roster. Functionally every character works the same way of course. You move them, and then you have a jump button, a pickup button (which you also use to throw), and a punch button that makes your character throw an uppercut. A simple control scheme, that anyone can understand. But having more characters would have been a nice touch. The five characters you do get are pretty cool though, each with neat little details. The human walks around in his BVDs. The Skeleton has some great inking for wear, and tear. The bug animates nicely. The carrot has a giant grin, and the other garish figure is so weird you’ll just fall in love with it. I would have liked more of that. It’s also going to disappoint some of you that this game has no online multiplayer. So if you’re someone whose friends are mostly long distance, you’re stuck playing against bots. The bots have pretty good A.I. but there’s nothing quite like playing against other people. This is why the Switch version is also an attractive option. Because it’s exactly the short, and simple kind of game you can take to a family gathering, or play with strangers at a coffee shop or with your coworkers on a lunch break. The other versions are great if you do have people over regularly. But for those who don’t, but who do own a Switch, it’s something worth considering. If you pretty much only play by yourself though, it’s not as easy to recommend. All of that said though, this is a phenomenal multiplayer experience. It’s also a cut above many other Smash clones because it plays so much differently. There may be four of you, and an arena. But the basketball mechanics really make Slam Land stand out. In fact, if you’re looking for a party game, and you’re not a fan of Super Smash Bros., you may just find you’ll enjoy this because of that different goal. Bread Machine Games should really commend themselves on making such a simple, yet addictive spin on the platform fighter. It might not be as deep as Nintendo’s own game, but it is a super fun game that can complement it nicely. If you’ve got a Steam account, a PS4, or a Switch, and want something a little bit different pick up Slam Land. Last time we looked at an old, and underrated fighter. But this time out we’re looking at something newer. Arc System Works created something special when it brought the Guilty Gear series to the world. A highly stylized 2D fighter, it had some of the smoothest, and most impressive animation ever. The details in the characters were also a sight to behold. They followed up that success with BlazBlue. A different series, but with the same commitment to detail, and fluid animation. This drew the attention of other creators, and before long they were making games based on other properties. So now we have a BlazBlue crossover game. Does it hang with the likes of Namco’s Tekken Tag games, or Capcom’s many Vs. titles? Is it something you should pick up? Read on. PROS: The brisk animation, and gameplay you’ve come to expect from ASW. CONS: Some may deride the repurposing of some sprite work. HOLY CRAP: The finishers in this game are pretty amazing to watch. The short answer to both of those questions is “Yes.” But let’s take the long answer road, and talk about why. BlazBlue Cross Tag Battle is a fighter that caters to the core player. The depth of the fighting system, and its complex multi-tiered combos are things you can spend hours just trying to grasp. Yet, it isn’t a game that newcomers can’t enjoy. Yes, there will be a vast skill gap when you first begin, and you’ll get destroyed online. But the game gives you plenty of features to start out with, and the tools to learn how to play properly. 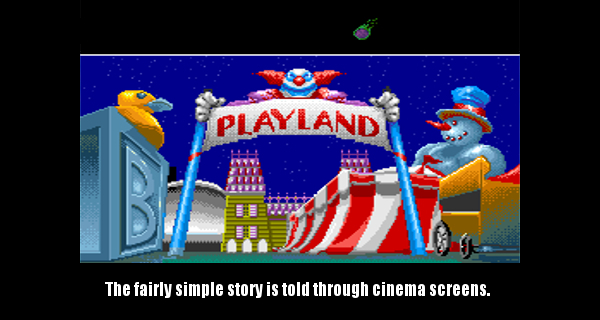 The initial mode of the game is a story mode. It isn’t terribly deep, but it does try to set up some kind of reason why all of these characters from different games are here. As the game features a lot of characters from properties, I’m not intimately familiar with I couldn’t begin to explain every detail. But the primary plot is that one of the characters from the BlazBlue universe has created some kind of super computer that has forced everyone together to fight in a tournament. Over the course of the tournament, the teams discover secret gems they can use to escape. Subsequent play through will fill in some more gaps, but generally this is a great way for you to get acquainted with the basics. You’ll be forced to play tag battle, after tag battle until you’re able to complete it. When you turn the game on, and start playing you’ll find yourself in an open arena with concession stands. These work as an elongated version of an options menu. You can walk to the center to begin the storyline mode. You can go to another door to go into the online lobbies, go to another to spend your in-game currency on avatars, icons, and tiles. Then there’s another that acts as an info desk. Of course you can also bring up a traditional menu if you’d rather do that. This can be easier than roaming around to different booths. One of the things you’ll find in the options is the training mode. The training mode in BBCTB is one of the better ones I’ve played in a fighting game. It tries to tell players in layman’s terms what the advanced mechanics do, which makes it helpful when you’re starting out. This isn’t to say that you’re going to play through the tutorial, and instantly comprehend it all. Yes, you can go through, and clear all of the lessons, but you’re not likely going to retain everything the game has to offer in one run of the sessions. These make for a pretty good reference guide. Even after you clear a lesson, when you forget how to do something, you’ll be able to go back to re-learn it. Of course like all fighting games, playing the game often is going to really help you not only retain the knowledge of how to do things, but learn when to use them. There is a lot of a risk/reward at play in the fighting system. For example, many of the game’s mechanics like dashes, and combos are centered around rush downs. Going on the offensive is a big, big, part of BBCTB. If you can get even a few small combos in, and put opponents on the defensive you limit their options. However, there is also a big risk when you do go for big damage. Because if you whiff an attack, or the opponent knows how to spot a high, or a low opening they can get a jump on you. The game also has a parry system too. So if your opponent has mastered timing, you could find them escaping your onslaught, and countering you. The game’s tag system is an integral part of this as well. While in the midst of a combo you can call in your second character in for a double team. You can also then take control of that character during the double team, or leave them there fighting as an NPC beside you. Knowing when to use each option is key. Obviously you can also swap characters when the one you’re presently controlling is beaten down, and needs a breather. But, again, if you’re being rushed down badly with low health you might not have a chance to do so unless you can manage to parry first. Tag teams can also use up your gauges at the bottom, so you’ll also want to be managing those. Also, being an Arc System Works game, you can expect a lot of highly stylized finishers of varying degrees. There are Distortion finishers where the end of a match comes with flashy spectacles filled with bright colors. But if you can manage to max out your gauges, and time the motions properly, you can do Astral finishers. These are mesmerizing displays that are so visually appealing you’ll enjoy them. Even when you’re on the losing end, you’ll be wowed upon seeing them the first several times. Playing the game online will be the bread, and butter for most people, and so you’ll be spending a lot of time in the lobbies. There are many of them. Some categorized for absolute beginners, others for the general audience, and then you have the ranked lobbies. In all of the lobbies, rather than be given a static menu, you move an avatar about an arcade. You can move up to the left or right position of any machine, and wait for a challenger, or walk up to anyone presently waiting for a challenger. The game also lets you communicate a number of ways. You can use icons with common gestures like “GG” or Good Game. You can use body language with your avatar. For instance you can have them bow. Or jump in place excitedly. Probably the best option is pulling up an on-screen keyboard, and typing in a short sentence. Once you’re ready to fight, the game transitions to your character order screen. You can choose your characters in the online option menu before challenging someone. Once you’ve selected the order, one player chooses the stage, and you’re in a match. In my experience on the Nintendo Switch, most of the matches have had a solid connection even over my wireless network. There were a handful of moments where lag crept in, but for the most part it’s pretty solid. Other versions may fare better, but as far as I can tell, it should be a pretty good experience when playing online. You can also invite friends to play online should any of your friends also own the game. Local versus play is a lot of fun though, the wide variety of characters is nice. You’ll be seeing not only characters from BlazBlue, but those from the Persona series, Rooster Teeth’s RWBY, as well as Under Night In-Birth franchises. Plus every character seems fairly viable, able to dish out a lot of damage. Undoubtedly as the best skilled players get into the deepest pros, and cons of each there will be the expected tier lists of which teams are best suited. For anyone new to fighting games, there are also a few auto combos on hand. Arc System Works also follows the trend of other fighting games, by offering extra characters via DLC. You can buy them individually if you wish, but there is also an option to get all of them, including the ones that haven’t been announced. And while this is going to disappoint some players expecting a full roster out of the gate, they have vastly undercut other fighting games in this area. One really cool bonus that the game does include however is an EP on mini CD. A few of the more noteworthy songs from the game’s OST are on it. Speaking of the sound, it’s all very good. It includes not only a fairly good soundtrack ranging from Rock to Orchestral but the sound effects are loud, crisp, and sync up with the onscreen action. Moreover you get a lot of great audio performances here by both the original Japanese actors, and the English actors. You can also mix, and match by character. Visually, the backgrounds are nice, with some great 3D models, while the 2D sprites of characters, and animation are top-notch. One thing some fans have complained about however, is the fact that some of the characters are composed of frames of animation from older games. I will say this is noticeable, especially on a large TV, and the result is that in some matchups, one character will look a little bit grainy versus another. Overall though this is a fairly minor nitpick. The underlying mechanics in this game are fairly different from the other BlazBlue games for one. Second, this is hardly the first fighter to do so. Capcom Vs. SNK 2 was especially remembered for doing this, and it was still one of the most beloved entries in Capcom’s Vs. series. This is also a non issue if you’re playing this on the Switch on the go, as you’ll barely notice it on the small screen. In the end I think this will be fondly remembered by fighting game enthusiasts. Not everything in it is going to be loved. If you like a more defense focused fighter, you may appreciate it a little bit less, and you’ll be buying characters as it’s par the course these days. Still, I’ve found myself really enjoying the mechanics a lot in spite of being completely outclassed by nearly everyone online. If you’re a die-hard fighting fan who hasn’t checked it out already, or you’re just someone who hasn’t played a new fighting game in a while you may find yourself enjoying it as much as I have. All of that being said, those who decide they want the Switch version would do well to pick up a traditional controller option or an arcade stick. While the game is playable on the go using the joycons, the lack of a D-pad makes performing some of the sequences a bit more difficult. Beyond that, the game performs well on the console, and if you’re looking for a fighter for the Switch, this is a nice one. Back in the ’90’s fighting games were in full swing. Easily the most popular genre in arcades, there were countless titles ported to the Super NES, Sega Genesis, as well as other platforms. On top of this, many publishers pumped out fighters hoping to be the next Street Fighter grade success story. As such, a number of games came out for home platforms in lieu of arcade machines. One such game was WeaponLord. PROS: Beautiful graphics. Deep fighting system. Fun. CONS: Figuring out the game on your own isn’t intuitive. NAMCO: Is rumored to have loosely based its Soul Edge & Soul Calibur games off of this. WeaponLord is both one of the most difficult, and yet rewarding fighting games I’ve ever stumbled upon. I found my copy at this year’s ConnectiCon, and knew basically nothing about it going in. As we did in the 1970’s, 80’s, and 90’s I went into this based on the label/box art. I suppose I could have used my primitive phone’s web browser, but that wouldn’t have been much fun. Anyway, WeaponLord focuses on fighting with swords, axes, hammers, and other melee combat weapons rather than martial arts moves. The brainchild of James Goddard, and Dave Winstead, this game is a lot like Barbarian. Except with a better roster, and interesting, complex mechanics. This makes sense when you learn that the Conan mythos, and other fantasy properties were an influence in its creation. Goddard, and Winstead had come from Capcom during the heights of the Street Fighter II phenomenon. Goddard also created the character Dee Jay who first appeared in Super Street Fighter II: The New Challengers. Around this time the short-lived Xband modem was being hyped up for the Super NES, and the Sega Genesis. These two developers wanted to make a fighter that could take advantage of it, and try to get the lowest lag possible. This was a time when mainly computer games could be played one-on-one over a phone line. The concept, while not new, was very rare on consoles. The one high-profile example of the Xband was the 1v1 Deathmatch mode in the Super NES port of DOOM. Strangely the feature wasn’t even advertised in that game’s manual. Anyway, to make their game, Goddard, and Winstead would leave Capcom, and join Visual Concepts to make WeaponLord ar reality. Were they a success? Yes, although not nearly the success of the games their former employer made were. WeaponLord is an ambitious game, and it shows. The graphics, and animation are top-notch. Remember when I said Conan was an influence? The characters, and backgrounds on display will remind you of a Boris Vallejo painting. The pixel art, and sprite work details are nothing short of spectacular. Characters are fairly large, and everything looks breathtaking. This comes at a high price however. This stuff takes up a lot of storage capacity, and memory. So the game has a small roster. This also means that matches are considerably longer than in other games, because things move along much slower. If you’re used to playing flashy modern fighters at 60 frames per second, you’re not going to get that here. You’re not going to get the standard pace of a 16-bit era Street Fighter or Mortal Kombat port either. However, if you come into WeaponLord with an open mind, and a willingness to learn, you’ll find a deep, and entertaining experience. As the game focuses on swords, clubs, and blades it doesn’t share a weak, medium, fierce attack setup, like many other games of the era did. Instead you have backward, and forward swings. There are three of each, and go from fast, but weak to slow, but strong. The basic moves also integrate your movement. So a crouching forward swing works completely different from a standing one, or while in the air. This may seem obvious to veterans of the genre, but it’s going to be a lot more noticeable to newcomers in this game, than some of the more popular fighting games out there. Special moves don’t generally follow the circular, and charge motions of a lot of popular games. A number of them do, but you’ll find a lot of them if not most of them are similar to Primal Rage. You have to hold an attack button, do a motion while holding the attack button, and then release it. It takes a bit of getting used to, but once you wrap your head around it, you’ll start learning how to link normal, and special moves together a bit better. But the game also has a very good parry feature. Holding a weak swing button, and moving forward, up, and down can perform a deflection if you time it properly. This puts the opponent into a short stun, and allows you to capitalize on it with a combo. But this feature is also risk vs. reward. Because if you do it too early you’re going to get stomped, and if you do it too late you’re already getting stomped. Unfortunately because of the era this game came out in, there isn’t any real tutorial to speak of in the game. You only have whatever information the manual lists, and nothing else. But that shouldn’t stop you from picking up, and enjoying vintage fighting games like this one. Especially when you stumble upon one that is this good. The depth continues when you discover that some moves will break weapons if you manage to land them, at just the right time, during the right frame of animation! If you manage to do this, your opponent’s attacks will actually do noticeably less damage! One thing that isn’t as deep, but is a cool Easter Egg is finding that similar conditions can actually damage your opponent’s outfit. Pieces of armor crack, hair gets cut off, textiles get torn. Seeing this stuff is pretty cool even today. It also wouldn’t be a 90’s fighter without a finishing move, and WeaponLord has its own take on the idea. Again, this is a part of the game that reminded me a lot of Barbarian, an old Commodore 64 fighting game, that while simple, featured gory dismemberment. WeaponLord doesn’t have the over-the-top fantastical fatalities associated with Mortal Kombat or Killer Instinct. Instead, it has long combo strings, that if you can pull off, results in decapitation, missing limbs, and disembowelment. These executions also play a part in the game’s story mode. The game has three main modes. First, there’s a story mode, where you take your character through an arcade ladder, and get some lore throughout the process. It plays as you might expect, going along, getting victories, and then fighting a boss character. Beating the boss character gets you an ending, and there you go. Except that WeaponLord’s story campaign changes based on the difficulty level you’re playing on, and whether or not you kill off your opponents. If you don’t kill these characters in your initial two out of three match ups, you have to fight them again later. These conditions also change the ending you’ll get, so it gives you incentive to play it a few times. Apparently the Sega Genesis port doesn’t eschew the rematch upon killing opponents. But the storyline is still a similar experience. If you pay attention to the storyline, you’ll find that the game has two stories. The story in the story mode takes place after the tournament, while the arcade mode tells the story beforehand. Beating the story with each character gives you part of a password you can use to play the story from the boss character’s perspective. The second mode is the bog standard arcade mode. Here it’s just a matter of clearing the arcade ladder, but without the additions of the story mode. But, if you want to get into the lore, you’ll want to play it for the prequel content. Finally, you have the Versus mode, which is the meat, and potatoes of any fighting game. If you can get some people over, you’ll have quite the fighting game night for many of the reasons outlined above. In all honesty this is one of the best fighting games on the Super NES in spite of the sluggish movement. On its face it may seem like yet another clunky, mediocre game. There were a lot of them back in the day. But stick with it, and you’ll find WeaponLord is a winner. WeaponLord was published by Namco, and so the innovations in this game appearing in its later series like Soul Edge, and Soul Calibur won’t go unnoticed. It’s rumored that the developers of those games were inspired by Visual Concepts’ barbarian fighter, and it’s easy to see why. Many of the things these games brought to the forefront of the genre were introduced in this obscure title. Had this game not come out the same year Killer Instinct was ported to the Super NES it might have gotten more attention. As it stands, this is one of those games you should really check out if given the opportunity. It has a steep learning curve, but once you pick up some of the basics you’ll find a very entertaining fighter filled with personality. It isn’t perfect by any means. The game could stand to perform a bit faster, and it should have spelled some of the combat out better. But this should not have its identity mistaken for mediocre stuff like Street Combat. It may be rough around the edges, but WeaponLord is awesome. What can be said about Street Fighter II that hasn’t been said already? The original Street Fighter while by no means a horrible game, was mediocre in a few ways. It had some sluggish movement. Special moves did a ridiculous amount of damage. However, performing special moves was inconsistent. Sometimes the hit detection seemed off. The soundtrack wasn’t very good. It had grainy audio. Yet there was a ton of promise in it. It had wonderful characters, pretty cool graphics, and it was still a cut above earlier games like Karate Champ. But it still could have become just an obscure one-off. Thankfully, Street Fighter II scrapped the parts that didn’t work, fine tuned everything that did. Then added a bunch of new features. You could play as characters other than Ryu, and Ken. Plus you could really compete with other people for something other than score. Every iteration of the game added, and refined more. You could play as the bosses. You could play at a faster speed. You could play as newer characters. You could do finishers. Every iteration also changed character attributes to try to bring everyone just that much closer. Not only was it leagues ahead of Street Fighter, it became a phenomenon. So now there’s an even newer version of a twenty-six year old game to play on the Switch. With a collection around the corner, should you still get this? PROS: It’s Street Fighter II. One of the best games of all time. On the Switch. CONS: Doesn’t add all that much bonus content to the package. I’VE GOT NEXT: It does bring a taste of the arcade era in portable form. Ultra Street Fighter II is a pretty awesome game. It’s Street Fighter II. That’s already pretty awesome. That’s a given. But what makes this iteration worth playing over another? Chances are you own at least some version of the game. If you don’t, and you have a Switch, well then this is a no brainer. For a lot of other people though, they’ll need more than that. For the five of you who were around in the 90’s, and somehow never played the game, what you do is simple. Pick a character, beat the other characters in two-out-of-three bouts, until you get to the final boss, and beat him too. Beyond that, you can play against other people for supremacy. It’s also great for a game night. Street Fighter II, in spite of the technical aspects of it, is still an approachable game. Newcomers who weren’t around for it when it was new, can still pick it up, and have a good time. It has a fair amount of depth, and complexity. But it isn’t going to look impossibly daunting to someone who has never touched a fighting game before. At least not compared to something like Guilty Gear Xrd. We all have that friend who insists the party starts with something like Guilty Gear Xrd. Anyway, It’s a lot of fun for newcomers, and veterans alike which is a big reason why Capcom likely chose to update this game for the Switch. In terms of new additions, the obvious one is the ability to play with either the original coin-op graphics or to play with the newer HD Remix inspired graphics. There isn’t any difference in game play between them. When playing in either style everything looks terrific. The HD style looks crisp, vibrant, and detailed. All of the art assets from Udon, are completely on point. The coin-op graphics are also crisp, vibrant, and detailed. They also display in 4:3 aspect ratio which is great. Sometimes a retro release still comes out these days, that zooms or stretches everything into 16:9 by default, and looks just awful. Not the case with Ultra Street Fighter II. Now sadly, there isn’t anything in the way of CRT simulation filter options with this game. So if you do play with the older graphics, you’ll see every last pixel. Personally, I always preferred sharper images. So even in the 90’s playing crisp Super Street Fighter II for MS-DOS on a monitor looked nicer than blurred Super Street Fighter II for the Super Nintendo on a TV. But I know not everyone feels the same way. If you don’t, and seeing all of the squares bugs you, you may want to stick with the new style. A couple of other things were thrown in too. You can play the game in a Co-op version of the arcade ladder. Basically turning the bouts into handicap matches. It’s definitely something to try to see if you’ll like it. But it isn’t as fun as the core game you come into a Street Fighter II release for. The same can be said for the Way Of The Hado mode they’ve included. Now to be perfectly honest, I really like this mode. It’s a really fun mini game that you can break out at parties because of two reasons. First, (at least for me) the motion controls were spot on. Second, after you use the trainer to figure out how to hold the joycons for each move (Kind of like the Wiimote, and nunchuck for gestures in some Wii games) you can go into one of two modes. A story-like mode, or an endless mode. The story-like one has an ending you can make it to if you’re good enough. The endless is there more as a high score arcade game. It uses some of the graphics from Street Fighter IV to make a first person mini game. In it you throw fireballs, dragon punches, and other signature attacks as Ryu to beat up M.Bison/Dictator’s goons. Over time they can shoot fireballs back at you, and do other moves. Fortunately, you can also block. Again, it’s honestly a fun distraction. But, also again, it’s just that. It isn’t going to keep you engaged nearly as much as the core game you buy USFII for. The game does have online play, and it seems to be fine most of the time. It’s about as good as Ultra Street Fighter IV‘s is. 85% of the time you’re going to get a good to great connection, and have an awesome match. 15% of the time, you’re going to get a jittery mess of a match, possibly a disconnection. I tried this mode at home where I have a good internet connection, at hotspots where things are mixed, and a relative’s, which has a good connection. I had pretty much the same experience everywhere. If you find you don’t have a great wireless connection to your router, you can buy the wired, USB Ethernet connector for the Switch. That can improve things a bit. In the case of the game though, it really comes down to the net code. Again, most of the time it seems fine. Some of the other bonus content in the game includes some in-house Street Fighter series art from Capcom. These were taken from a now out of print book. It’s really great stuff. You can’t use the Switch’s photo function on it though, likely out of piracy concerns. Still, it’s worth thumbing through it, particularly if you love art. Separate from the gallery is the option to add background themes to the menus. Nothing you’ll be excited about though. Some will love the included sprite editor though. It works a lot like the one that came way back in Capcom Vs. SNK 2. You can change the colors of three different sections of any given character, and save them in added color slots. This works in both graphical styles, and subsequently these edits will be playable in the game. In spite of some of the bonus content, and the inclusion of online battles this feels like a barebones release though. The extra stuff here does give you a little break from the mainline arcade, versus, and online battles. But that’s just it. They’re minor diversions. Even though they’re fun, they’re not really fleshed out enough to keep most people engaged. Most players will likely try them, and then go back to the one on one fights. Had there been even more graphics options, like a simulated CRT filter, or more characters or backgrounds it would give old-time fans more to get excited about. The three new characters you do get are ramped up versions of Ryu, Ken, and Akuma. And they’ve appeared in other Capcom fighting games before. Evil Ryu, Violent Ken, and Shin Akuma (whom you need an old school sequence code to use) are all fun to use. But they all have insane damage potential. Shin Akuma is even barred from online competition. So some of the top-tier players who play in tournaments have their concerns. For the rest of us, they also take a lot of damage. So average to good players who don’t need to bother with tournament level stuff like obsessing over frame data or lists won’t care. As is the case with most Capcom fighters, the trainer does let you see inputs, and some other information. On that note, I do want to talk about controllers with this one. Playing the game with the joycons on the console or in the grip is fine. For the most part. It feels pretty close to using a standard game pad, though I found sometimes the analog stick would read a forward jump, as a jump. Playing the game with the joycons as two separate mini controllers is not that bad. It’s not great, and you’ll have to get used to rounding your index fingers to press the Z buttons. But it works. It basically follows the format of the Super NES controller. So if you’ve played any version of the game on the Super NES, you’ll know what to expect. That said, while it’s something you’ll live with when playing other people at Starbucks, you’ll probably want another option for home. There are a host of options for the Switch. The pro controller, aftermarket controllers, and even an arcade tournament joystick by Hori. Depending on your preference, and budget you’ll probably want to invest in one of these options at some point if you haven’t already. In the end Ultra Street Fighter II is worth getting for a number of scenarios. Bringing the aforementioned arcade experience to a public setting. If you’re a fan of the game who no longer has an old console or computer version knocking around. Or if you’re getting back into it for the first time in years. Or if you’re just a big fan of fighting games in general, and you’re building a Switch collection. It’s a really fun version of Street Fighter II. With SFII being as timeless as classics like Pac-Man, Centipede, and Space Invaders it’s also a pretty safe bet. Just don’t expect much more out of it than a really fun update of Super Street Fighter II Turbo. The other stuff is nice to try, but isn’t the headline act. Also remember this version of the game isn’t included in Capcom’s upcoming collection. It’s been said many times that imitation is the sincerest form of flattery. While there is some truth to that old adage, sometimes it isn’t the motivation. In video games a popular idea being copied is nothing new. But sometimes a copied idea will still go in a different direction, and become transformative. Often times this has gone on to create genres. Street Fighter II was one game that had its idea taken, and tweaked time, and time again. Many times, good things came out of this. Mortal Kombat is an obvious example. But there were a number of great fighting games from SNK. World Heroes, Fatal Fury, Art Of Fighting, Samurai Shodown, and King Of Fighters. To name a few. But one could also argue Street Fighter built from the basics early karate games like Karate Champ, and World Karate Championship (Known as International Karate in Europe). The point is, that a lot of great games came out of experimenting with Street Fighter II’s rules. Two characters go one on one, until time runs out, or one player knocks the other unconscious. First to do it twice wins. Some did a lot of new things with that setup. Data East on the other hand, did not. PROS: Graphics. Sound. Play control. CONS: Not much to stand out from other games in the genre. CLONES: Ryu, Chun Li, and Zangief doppelgänger fighters unite! Fighter’s History is one of the more interesting video game clones in history. Because of just how close to Street Fighter II it truly is. The backgrounds may look different, and the soundtrack may be different. But that’s about it. Nearly everything else in the game is almost identical to Street Fighter II. A couple of the characters are even a stone’s throw from being indiscernible from their Capcom counterparts. In fact Capcom took Data East to court over the game’s similarities. Which were acknowledged in the case. But Capcom would eventually lose on the grounds that the core tenants are those of the fighting genre, more so than those of Street Fighter II exclusively. Still, it was an interesting case that I’m sure one with a law degree would be much better adept at writing about. Anyway, the game was first released to arcades in 1993, and a year later to the Super NES. Again, the concept is the same as Street Fighter II. Nine fighters enter a tournament to see who will be crowned the best. So you’ll choose your fighter, and go into two out of three round match ups, and hopefully win your way to the top. Once you defeat the other eight characters, you’ll go on to face bosses who are behind the tournament. In Street Fighter games that usually means a mysterious dictator running Shadowloo or some other criminal empire. In King Of Fighters it’s many times Geese Howard. In Mortal Kombat it’s usually a demonic force led by Shao Khan or some other evil bad guy. In this game the mysterious K is Karnov. Yep! The fire-breathing guy with the beer belly you took on an action platforming adventure, or beat up in Bad Dudes is the boss. But before you fight him, you have to beat up a generic clown. A clown so generic, he’s just called Clown. With the other borderline infringement characters here, you’d think they would have attempted Not Joker, or Not Ronald McDonald. But no, you just beat up a clown. Be that as it may, Fighter’s History is also one of the better SF II clones of the day because it hearkens so close to the Capcom formula. Hit detection is pretty good, and the move sets work about as well as they do in the actual Street Fighter II games. I’ll give Data East credit in the graphics, and sound department too. Because even though a lot of stuff came blatantly from SF II, there are still moments of originality in it. Namely, the backgrounds. The details in the stages are quite nice. They could have just re-made versions of iconic Street Fighter II locations the way they did with some of the character design. But they didn’t. They made their own, with some of their own original background animations. It’s worth seeing them in action. The characters themselves are animated well, and when the game does give us a character that isn’t cribbed from a competitor, it works nicely. As much, as I harped on fighting a generic clown, and Karnov earlier, they do look pretty cool. Fighter’s History also does one thing few other fighters did back then, and that is it adds location damage. If you keep attacking one spot on your opponent, eventually that spot will change, and reward you with more damage. For instance, if you keep hitting the Ryu stand-in in the head, eventually he’ll lose his bandana. At which point subsequent hits will do more damage than they did earlier in the match. This does add a tiny layer of strategy to the basic fighting game rules set out by Street Fighter II. You can also play as the clown, and Karnov through the use of a code. However, the game still pales in comparison when it comes to balance. Obviously no fighter can ever be 100% even across every one of its characters. But in Street Fighter there are enough pros, and cons to each to make them viable options for different kinds of players. Ryu is a good all around character. Zangief is all about powerful moves at the expense of speed, and energy. Dhalsim is a hit, and run strategists possible choice. Other games in the genre took that aspect of the game to heart more than this game did. Some characters may look the part, but weren’t given the same level of care. As such you have some characters that will dominate most of the roster once they’re placed in an above average player’s hands. Still, the game did well enough to get two sequels. The first of which was Fighter’s History Dynamite on the Neo Geo. This game continues the storyline from the original, as Karnov wants to essentially re-match everyone after his loss. The third game was exclusive to the Super Famicom, and came out in 1995. Over the years, the series has been briefly thrust back into the limelight, as SNK Playmore worked out deals to put some of the characters in some of the King Of Fighters entries. If you’re a die-hard fighting game fan, or you love curious titles with some historical significance Fighter’s History is worth looking into. It’s a cut above some of the other stuff you’ll find on the Super Nintendo like the awful Street Combat. (Oddly enough, another fighting game curiosity.). But if you’re not, there isn’t a lot of stuff here that will make you choose playing it over the ports of Street Fighter games, Fatal Fury games, or the World Heroes games. Those games offer more balanced rosters, and enough unique things to make you keep coming back. It doesn’t make Fighter’s History a bad game, and collectors may want to find a copy. But as far as its competition goes, a lot of it is superior or different enough to choose over this one. There aren’t even many modes. There’s the arcade ladder, a survival mode, and the quintessential versus mode. It’s a good curiosity, and preferable to many a bad fighter. But unless fighters are your genre of choice, you’re better off playing the staples from Capcom, SNK, and Midway on the Super NES. Super Smash Bros. It’s arguably one of the most popular Nintendo franchises. Some may even say the most popular Nintendo franchise. From the original Nintendo 64 game all the way up to the Wii U iteration, it’s an iconic game. But fans will constantly debate what version is best. A passionate group of Smash fans would tell you it is the Gamecube version. And whether you agree with that or not, you have to admire that level of dedication. Not only have they gotten it recognition in the fighting game community as a competitive game, they’ve gotten it featured in tournaments. So of course it was only a matter of time before companies would try to make their own platformer fighting game hybrids. Some of them terrible, some of them just okay, and some of them pretty damn good. PROS: Super Smash Bros. Melee pacing. Unique features. Great character designs. CONS: Relatively small roster compared to other fighters. Not a lot of single-player stuff. WHAT? : Is what you’ll ask confusedly upon seeing some opponents’ recoveries online. It would be easy to dismiss Rivals Of Aether as another Smash pretender. It has a similar 4-player party fighter feel. It has the same general goal; knock everyone off of the stage, and be the last one standing. It has a cast of characters with nowhere near the recognition of Nintendo’s major IP. Some of you may even ask “Why bother playing this over any of the Super Smash Bros. games?” But before you sigh, click on a different site, and prepare to see if Mr. Game & Watch has finally made it to S-Tier thanks to a professional player’s new discovery hold on. Because Rivals Of Aether is actually quite good. The game may not have the high production values, marketable Nintendo mascots, and blockbuster score. But it’s probably the best of any attempt to compete with Nintendo’s formula yet. Yes. Better than Sony’s attempt. And better than Papaya’s Cartoon Network themed clone. Both of which were solid efforts. Right from the get go, this game makes no qualms about who it targets. If you’re one of the die-hard Super Smash Bros. Melee fans out there, Rivals Of Aether is hoping you’re going to pick it up. Assuming you haven’t already. But if you’re not, and you enjoy the Smash games, you may just enjoy this as well. This game embraces the competitive end of the Smash fandom. You’ll find no items, or power ups. Not even for simple fun. What you will find, are some really cool looking stages, and characters. All of the characters make a great first impression here. They’re fairly unique (Except for maybe Wrastor who is clearly a Falco Lombardi stand in. ), and have designs that stand out. Upon getting into a match, you’ll find it plays very much like Smash. You’ll want to be the last one standing, as I mentioned earlier. It has similar play mechanics under the hood. Directional Influence is a major part of defensive play, affecting the angle of knock back when you’re sent flying. There are tilts, specials, and meteor attacks to boot. Enthusiasts will feel right at home here. But it isn’t a carbon copy of Super Smash Bros. either. Rivals Of Aether makes some enhancements that make it feel different enough to justify looking into it. It adds a second set of regular attacks it calls Strong Attacks. Where the Smash games have a button for regular moves, a button for special moves, and then different attacks based upon whether or not the stick was moved simultaneously with a button press this one adds a third button. It’s a small thing, but it also means another few moves per character. The game also has a bigger emphasis on parrying. If you can time the block button perfectly, it grants you a brief moment of reprieve by putting an opponent in stun for a second. It also brings in advanced tech techniques by timing movement just before hitting surfaces. Rivals, also puts in a wall jump technique which can be really helpful when recovering from a strong knock back. One thing everyone will love is the sprite work on display. The pixel art is really, really nice stuff that hearkens back to the 16-bit console era. This game oozes Super NES, and Sega Genesis in terms of motif. The chip tunes aren’t half bad either. Every stage has its own thumping songs that fit its visual flair. Interestingly, some stages will favor certain characters. To balance this out, at least in multiplayer, players can vote on what stages to disallow for a conflict. So if you see your opponent has chosen Orcane, you can put a giant red X on his stage so he can’t make easy saves by swimming. The game also has a pretty robust tutorial in it. Honestly it gives the level of care, and attention some of the better Street Fighter, and Tekken tutorials have had in recent outings. If you’re a newcomer it’s honestly worth checking out, and if you’re a Super Smash veteran you should at least look at it, as it can go over some of the differences nicely for you. It covers the absolute basics, but then covers combos, cancels, and the advanced wall jumping mechanics as well. Rivals has both offline, and online matches where you can play against random players, or friends. It’s, pretty fun. It doesn’t usually lag that badly unless the opposing player is on the other side of the country or world. And even then I’ve still had some matches that were playable. Not great by any stretch, but at least I could move without having to expect to wait 30 seconds to see Zetterburn take a step. Be that as it may, I still don’t recommend veering too far outside the realm of low ping opponents.There are also tag battle modes which can be fun to play, though I suspect most will play the Free For All mode the most. I was also impressed with the character creation tools. Like the ones found in King Of Fighters XIII, and Capcom Vs. SNK 2 you can change the color palette of the characters to use as a custom appearance for yourself. So if you want to make Wrastor green, you can do so. Where the game falters a bit is when it comes to one player modes. Aside from the excellent tutorial, the only real thing it has is the Story mode. Here, you take each of the characters, and play through their part of the game’s lore. Like most fighting games this is told by picking a character, playing through computer opponents in a 1v1 match, until you reach the final boss. After defeating the boss, you’ll get a bit more backstory, and credits. Once you beat the game with every character though, there isn’t much left for you to do. You can take the points you earn for playing, to unlock the secret characters. But beyond that there really isn’t much else. When considering the small roster, it doesn’t translate into much single-player time. Sure, one could point to the Abyss mode where you try to exceed goals the game sets with enemies, and items to beat. But for a game that wants to tear you away from Smash, that isn’t much. Don’t misunderstand me though, Dan Fornace, and his small team have done a terrific job in making a Smash-like fighter. If you don’t presently have a Nintendo console, and played a lot of Super Smash Bros. in the past, Rivals of Aether is a no brainer. If you do have a Gamecube, Wii, or Wii U, and love Super Smash Bros., you still may want to give this game a shot. Because it’s going to be more of what you love. As long as what you love is playing against other people in person, or online. This game has the competitive end set. But if your favorite parts of Smash have been breaking targets, Adventure modes, and Subspace Emissaries, Rivals may feel a little bit anemic. That said, if you’re a big fan of fighting games put this one on your radar. Ah, 1991. Capcom had given us the glorious Street Fighter II. A sequel to a ho-hum, tournament fighting game. It created a host of clones, while reinvigorating both fighting games, and arcades. Nearly every fighting game that has followed owes at least something to Street Fighter II. But with every popular idea, there is usually a parody waiting. PROS: Nice graphics. Decent animation. Good play control. Funny! CONS: Some of the humor dates itself. Not as fun as Street Fighter II Turbo. THEME SONG: As iconic as Street Fighter II’s introduction music. 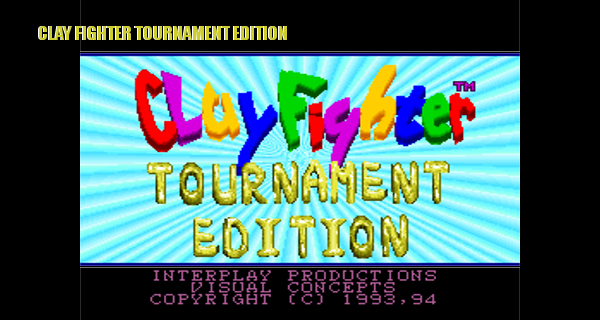 Clay Fighter Tournament Edition isn’t the first Clay Fighter. It’s technically an upgrade of the first game. It works in the vein of a Street Fighter II Turbo. Expanding the content, along with some tweaks. But just like the original vanilla version, it’s a parody of Street Fighter II. It also has a few jabs at Mortal Kombat, although there aren’t any fatalities to speak of. Actually, as you’ll see it mocks the entire fighting game genre. Clay Fighter TE has its own storyline. It’s silly, and preposterous but gives you a reason as to why these characters exist. As well as why they’re beating up each other. One day a meteor falls from the sky, and completely levels a carnival. When this happens, all of the various performers are mutated into stop motion behemoths. Each of them are stand ins for the archetypes you see in other fighting games. 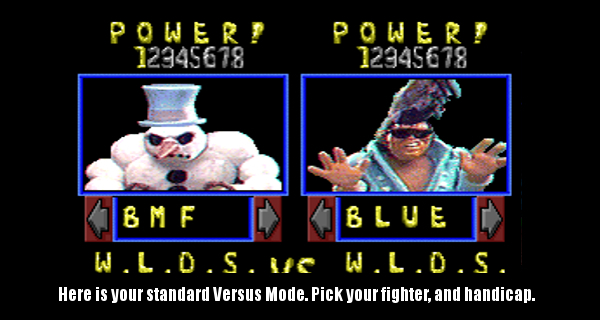 Bad Mr. Frosty is Clay Fighter’s Ryu. He is a snow man who spreads pain rather than joy. He is the flagship character of the series, appearing in every iteration. There are a host of other favorites like Helga, the opera singer. Taffy, who is made of, well, taffy. Bonker is a psychotic clown character. Because you can’t have a carnival or circus theme without one. But he’s honestly a pretty fun character here. There’s Ickybod Clay, a reference to Sleepy Hollow. There’s Elvis Presley impersonator Blue Suede Goo. There’s Tiny, who of course is not tiny at all. He’s the game’s Zangief. Rounding it out you have The Blob. Who is quite literally a blob of clay. The art, and general look of Clay Fighter is awesome. Each character has gone through a painstaking creation process. They were modeled in clay, then animated in stop motion, and then the animated frames were scanned into the game. The finished product looks somewhere between Street Fighter’s airbrushed look, and Mortal Kombat’s digitized actors. It would have been easy for Visual Concepts (Yes. That Visual Concepts) to have slapped some clones together or digitize their own actors. But the extra effort goes a long way here. Stage backgrounds are also really cool. As with the characters themselves, the stages are mostly clay models that were photographed, and placed in the game. You can tell which parts were drawn in to go along with the photos, which can be a little jarring. But for all intents, and purposes these are some well crafted backgrounds. 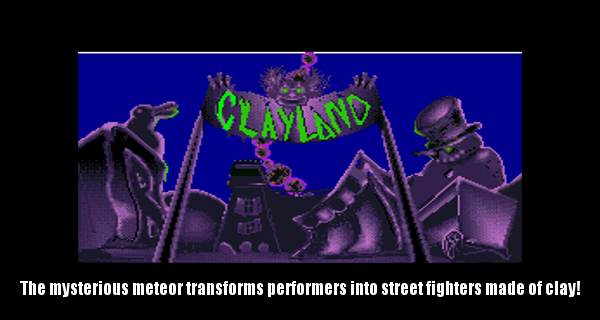 Moreover, the fighting system in Clay Fighter TE is pretty good. It’s clear the designers knew eventually the jokes would stop being funny. So they had to keep you playing. Rather than do it with more gimmicks, they built a solid game underneath it all. There is definitely enough here to make you fire it up every now, and again. The fighting system does borrow a lot from Street Fighter II. Most of the characters moves are performed with similar quarter circle movements, or back, and forward charges. As for the regular moves it also borrows Capcom’s 6 button layout. There are weak, medium, and strong attacks for both kicks, and punches. 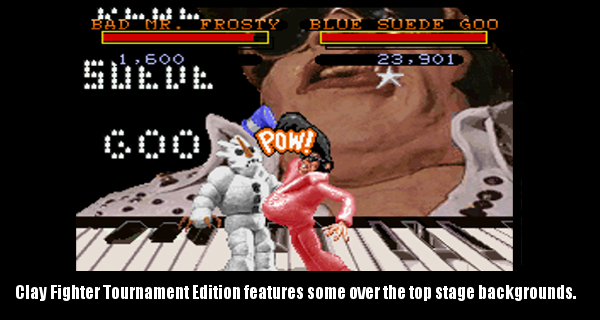 Tournament Edition also takes a page from SFII Turbo by implementing a speed feature. So if you’re used to zany speeds in your fighters there’s something here for you. 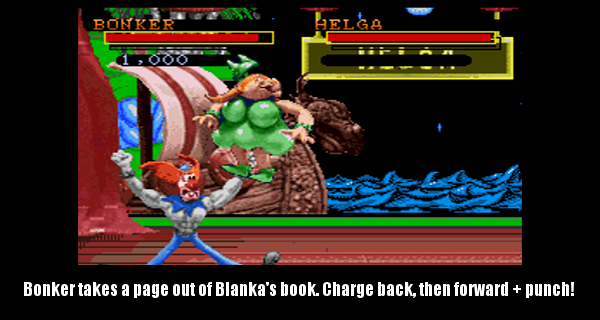 With that said, the game’s mechanics aren’t quite up to the level of Street Fighter II. The hit boxes around characters are a little bit more forgiving, and some characters have special moves with very similar inputs. Sometimes you might want to have Bad Mr. Frosty throw a snowball fist, only to perform his ice breath instead. While that is certainly bad news, it isn’t so bad that it takes away from the fun. The moves do work, but you’ll have to learn the specific differences in their commands. This way you’re consistently doing the special moves you want, instead of accidentally doing the ones you don’t. The game also does let you get in a number of combos, and two in one attacks. While you wouldn’t think a parody game could be competitive, Clay Fighter Tournament Edition actually can be. Even if it isn’t likely to be in a high-profile tournament these days. Those who simply love the fighting game genre should still find some fun in it. Clay Fighter Tournament Edition has your basic modes. There is the standard arcade mode where you have to beat the roster, then a boss. Strangely, the game will have you re match three characters once you beat the roster. Once you’ve done that, then you can go up against the final boss. The game’s boss is a little bit underwhelming though. It is just a bunch of clay balls animated to make out a face. It can use all of the characters’ various projectile moves. On higher difficulties the boss, and the game in general is a challenge. Often times things veer into cheap territory. But if you want the game’s best endings you’ll want to play the game through on its harder settings. Beyond the arcade ladder is the standard 1 on 1 Vs. mode. Each player picks a character, the number of rounds needed to win, and their handicap. Aside from that there is also the Tournament ladder. Here you can have up to 8 people play through a bracket to get to the top spot. Handy for the odd time you have a number of people over. Overall, Clay Fighter TE holds up pretty well. It has a goofy charm to its silliness. The fighting system is pretty good, and it is still fun to play. It might not be able to captivate you very long in today’s crowded crop of excellent fighters. But it is a fun diversion. Plus its still miles ahead of the mediocre fighters we’ve seen over the last 20 years. If you find a copy in your area pick it up. If you have a Wii, the original is also on the Shop Channel.